Easy Recipe for sweet Coconut Poli made with jaggery, Tamilnadu style preparation. With step by step pictures. 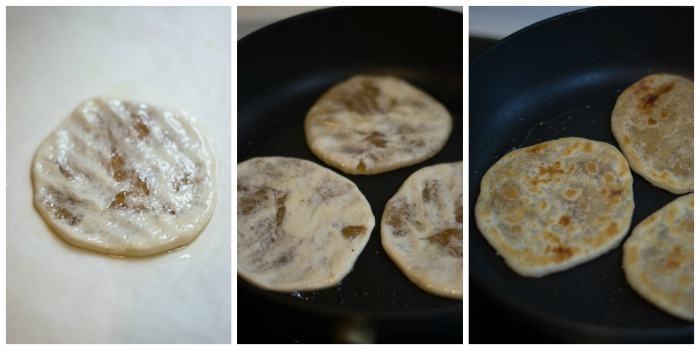 I have already shared the recipe for paruppu poli / paruppu obbatu. This recipe is made with coconut stuffing and its so delicious and rich. First, lets make the dough. I have used a cup of maida today. Add in 2 tablespoon of sesame oil and 1/3 cup of water to start with. Start mixing to form a sticky dough. I added 2 more tablespoons of water while mixing. The dough should be wet and sticky. Once mixed well, add in 2 tablespoon of vegetable oil to cover the dough. Cover and let the dough to rest for an hour. After the rest, the dough should be pliable but still tacky. You should be able to easily pinch a lemon sized ball from the dough. Set aside. The dough for sweet poli is ready. 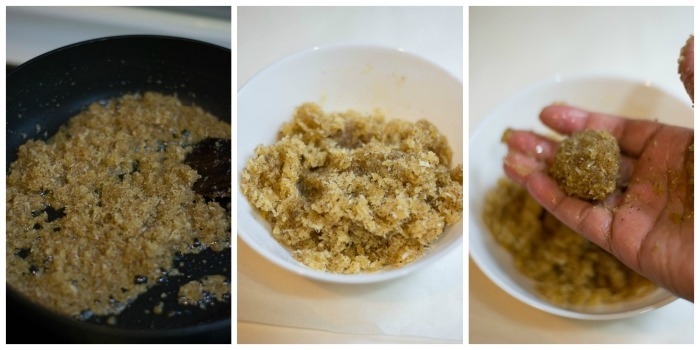 Boil the jaggery with little water (about 1/4 cup) till it completely melts. If you feel that the jaggery might contain impurities, strain at this stage and add back to the pan. Add in the fresh shredded coconut and cardamom powder. Saute till the mixture thickens. Set aside to cool. Make into small lime sized balls and set aside on a plate. Knead the well rested dough for a minute and make small lemon sized balls out of the mixture. Apply oil generously to your hands and take a small dough and place it on a wax paper. Start patting the dough to form a circle. Place the pooranam / stuffing ball in the middle of the dough and start covering the dough by pinching in the top. Gently gather the edges to the middle and pinch to cover the pooranam / stuffing completely. Repeat the procedure until all of the dough has been stuffed with pooranam. Set aside to rest. Apply oil to your hands and start pressing the ball gently to spread. I like to spread the ball on a wax paper. 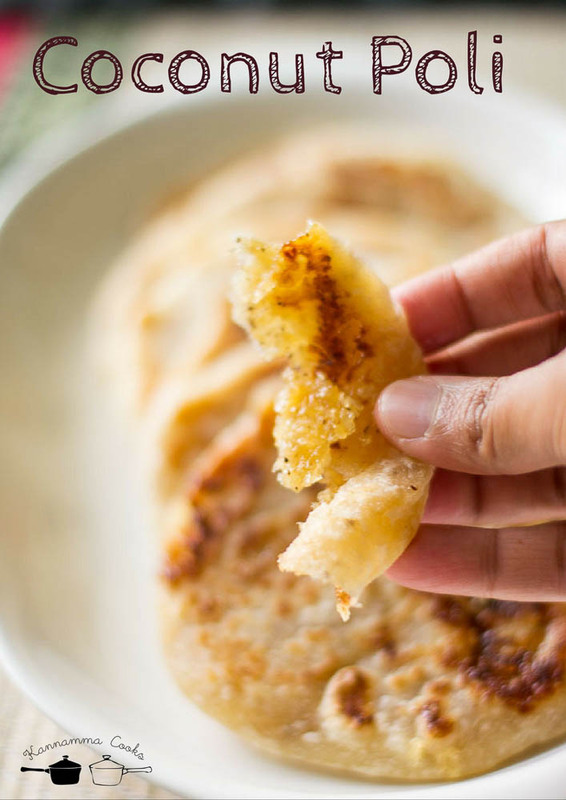 You can use a banana leaf, parchment etc… to avoid the dough from sticking while rolling. Let the ball be facing seam side up. 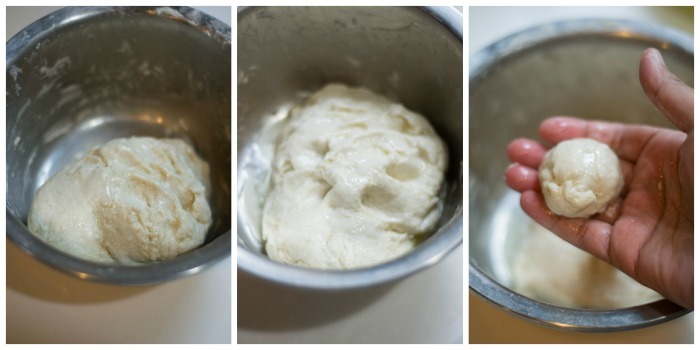 Start pressing gently to spread the dough to form a circle. Somehow the seam side ( the pinched side ) works better and I always press seam side up. Its your choice. Whatever you feel comfortable, go for it. Gently keep pressing the dough to evenly spread and form a circle. Apply oil again if necessary. Spread it into a 2 inch circle (approx). The dough will spread effortlessly. Gently release the flattened dough from the wax paper. 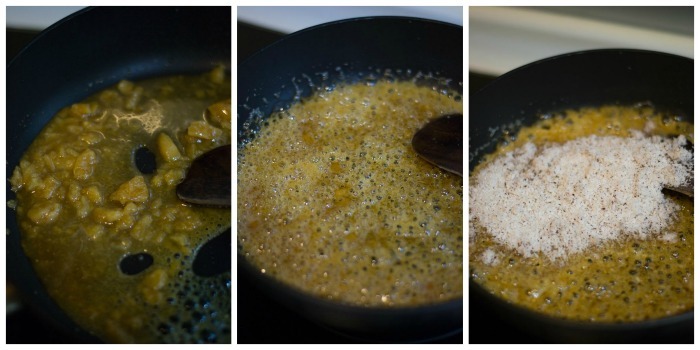 Set a griddle on heat on medium flame and place the obbattu and sprinkle some oil or ghee. Cook for a minute on each side. Once its golden on both sides, remove from heat and set aside on a plate to cool completely. 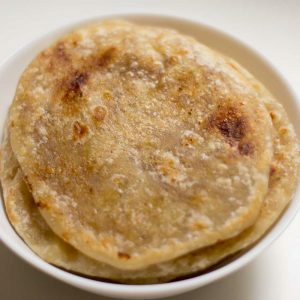 Once the obbattu is cooled, transfer to a container. I like to keep the obbattu in the refrigerator as the coconut stuffing tends to spoil at room temperature faster. It stays good for about a week in the refrigerator. 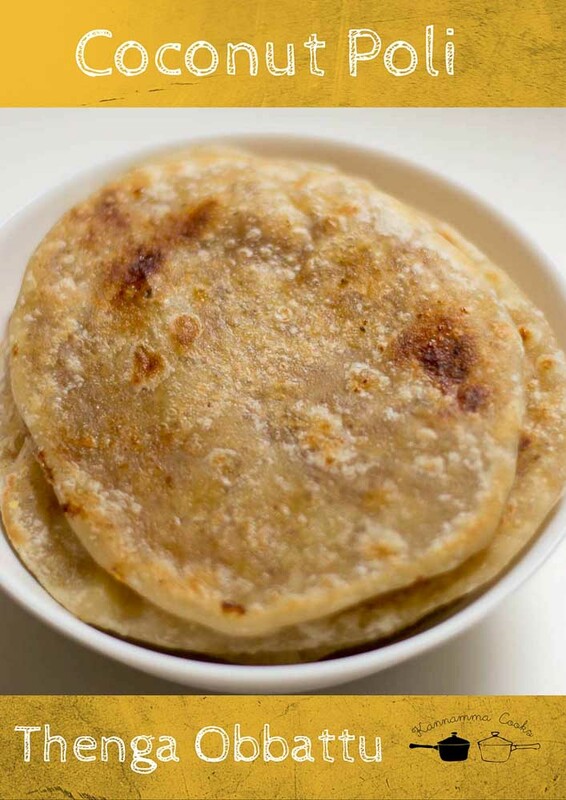 Serving Obbattu: Just microwave the cold obbatu out of the refrigerator for 15 seconds. Serve warm. I always serve my obbattu warm. Easy Recipe for sweet Coconut Poli made with jaggery, Tamilnadu style preparation. 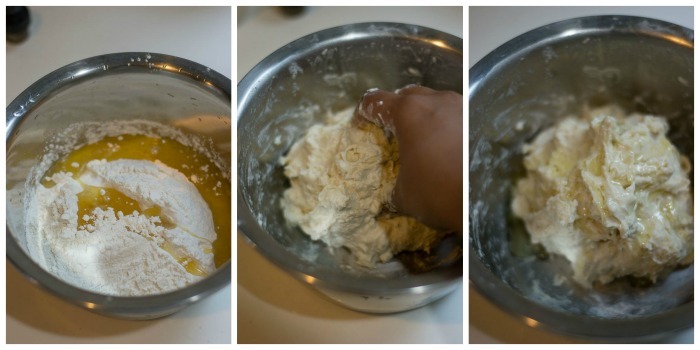 Mix the sesame oil, water and flour to make a sticky dough. Cover the dough with oil and allow it to rest for an hour. Set aside. Boil the jaggery with little water (about ¼ cup) till it completely melts. Add in the fresh shredded coconut and cardamom powder. Saute till the mixture thickens. Set aside to cool. Make into small lime sized balls and set aside on a plate. Apply oil generously to your hands and take a small maida dough and place it on a wax paper. Start patting the dough to form a circle. 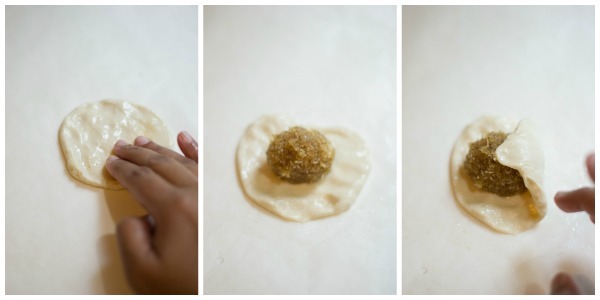 Place the pooranam / stuffing ball in the middle of the dough and start covering the dough by pinching in the top. Apply oil to your hands and start pressing the ball gently to spread. 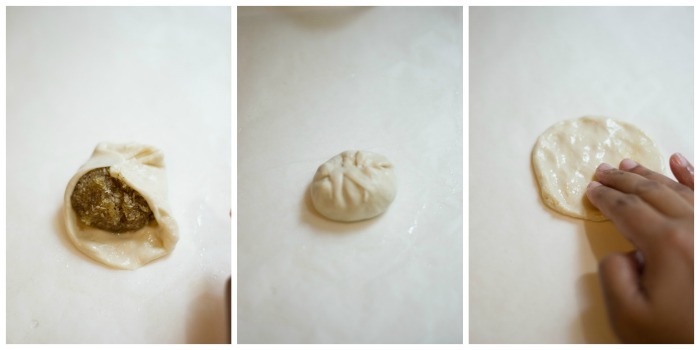 Gently keep pressing the dough to evenly spread and form a circle. Set a griddle on heat on medium flame and place the obbattu and sprinkle some oil or ghee. Cook for a minute on each side. Hi Suguna, made this recipe today. It was awesome.. really happy and thank you so much for such a perfect recipe.. Crisp and neat website with less intruding ads. A very good font selection, elaborate recipes, inviting photos , stories and situations that you recount from your life that make us reminisce of similar events in our life. No wonder you have a dedicated and growing userbase, Suguna, just wanted to take time to applaud your success. Very few people get a chance to succeed in their passion, you are the blessed one ! Thank you so much Prathiba. Your words mean a lot to me.